Merry Christmas, Happy Hanukkah, Happy Holidays & Happy New Year from MSCC! Just a reminder, the first tournament of the new year will be IAC's St. Dominic's on Saturday, January 10. The sections are K3, K6, K12 & K5 (unrated). 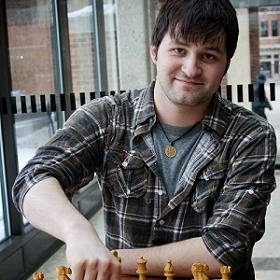 Please register at http://ia-chess.com/registration. Also, the first club practice will be Wednesday, Jan 14. Think Like a Strong Player! I'd like to spend a little time going over how our kids should THINK about chess. We see a lot of players looking at the board and not knowing 1) how to evaluate the position and 2) how to make the best move to improve their position. The most important thing is to start by thinking "Why did they move there, and what can they do to me?" 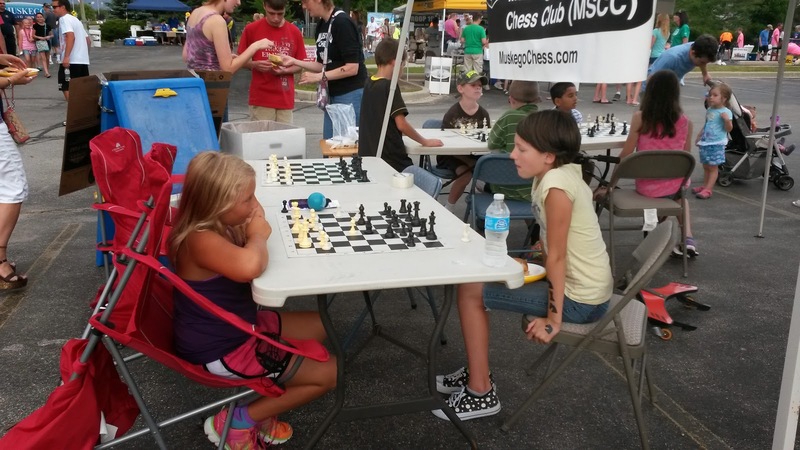 We've been asking this question for years in Muskego chess. The kids that DONT ask themselves this question have paid the price! KNOW WHAT THE OTHER PLAYER IS DOING (and how the game has changed with their move) before you decide what you want to do. 1) What are your opponent’s THREATS? any other tactical or strategic advantage that the opponent can gain on the next move. you in the concrete, exact position that you have on the board. Only real threats should be taken into consideration. 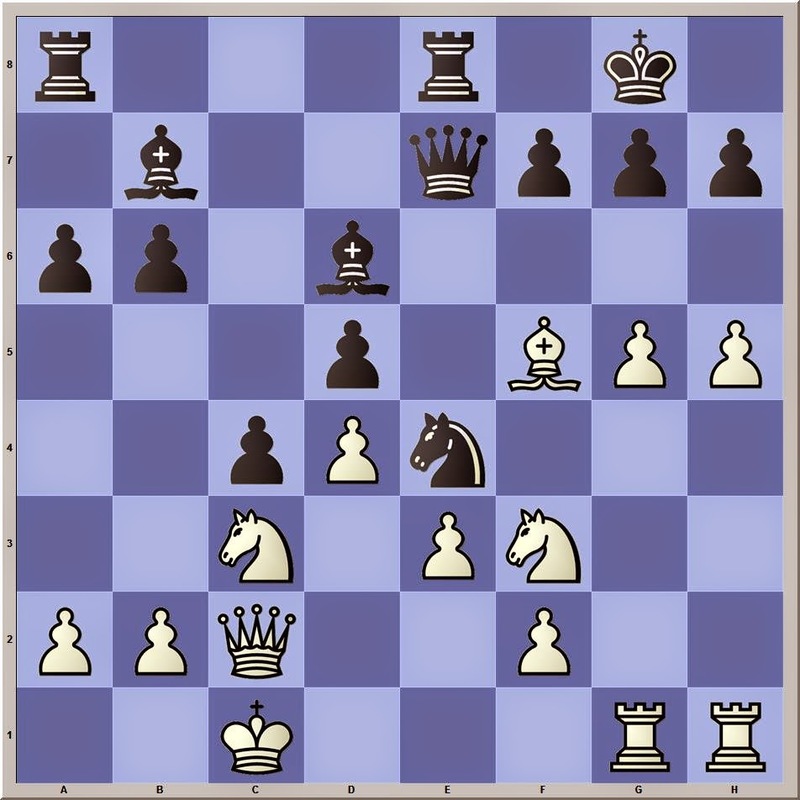 2) What are the CONSEQUENCES of your opponent’s last move? many others that you will soon learn to notice very clearly. Hello MSCC players & parents! Sorry for the delay, but here’s a summary of our own tournament last Saturday – we had good turnout, especially from our own club (36 players in total) and overall had a good day! Also very importantly, we raised over $700 to help offset some of the clubs materials & lessons costs. We really appreciate all those who volunteered to help plan & run the day – it went very smoothly! Some highlights from the sections – I’ll try to keep it brief! · Evan Stachowiak (MV) was our top finisher with 4 points – 3rd place finish. Welcome to the RED division, Evan! · The Mill Valley team of Evan, Logan O’Leary (1st tournament), Rachel Fredlund, Joshua Kierzek and Peter Morgan (also 1st tournament) took 1st place w/ 11 points ! · Evan Seghers (MHS) was our top finisher with an undefeated 5 points – 1st place!, followed closely by Kyle Jain (LDMS) with 4 points – 2nd place, and Reid Seghers (MHS) also with 4 points – 3rd place. · The MHS team of Evan, Reid, Fernando Collahuazo, Kolt Otterbacher, Sam Miller and Julie Redlinger took first place with 15.5 points! We had a good turnout at today's tournament. The results will be posted either by Coach Seghers or Mr. Schantz. 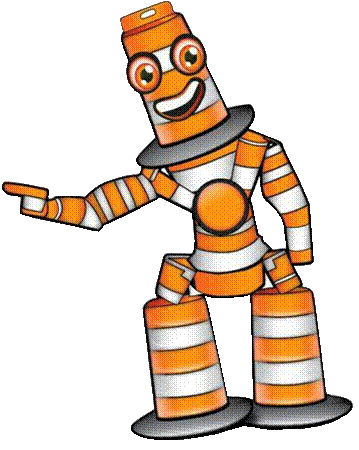 I just wanted to say thank you to all the volunteers that helped. I did post pictures on FB. Our highest rated player, Jason Markowski, just hit 1802 in a tournament at the Southwest chess club last night! His performance included a win and a draw against 2000+ players. Jason's regular rating for slower games is also the highest in the club, at 1777. St. John's Military Academy is a very interesting place to visit. We were there 2 years ago and returned again last night. Their chess program is always starting and re-starting, because their players turn over quite regularly. It's hard for them to keep momentum going over the years. However, they maintain a great program of very well mannered young men who give a good fight and are always both gracious hosts as well as visitors to any match they attend. Muskego won all 5 of the Varsity games (ESeghers, Collahuazo, Markowski, RSeghers and RGomoll), and all 4 of the JV games (Jain, Schantz, Miller and EBognar), with one forfeit because we were a player short. We won 40-0 in Varsity and 20-5 in JV, therefore, and are now 1-0 in the conference in both divisions. 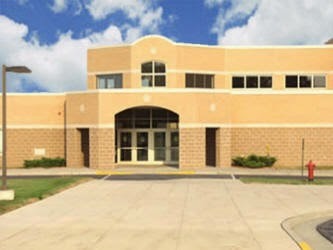 NEXT UP: Jefferson High School will visit Muskego on 12/16 after school. These are the open slots, please sign up if you haven't already done so. Thanks! >>CLICK HERE<< to register for the next IAC Grand Prix tournament to be held at LDMS on December 13, 2014. NON Rated: K-4 and K-8. Grades 9-12 must play USCF Rated K-12 division. The MSCC welcomes a new player to the BLACK division, our highest wrist-band level in the MSCC. This weekend, at the University School tournament, Kyle Jain did very well and raised his rating to 1309! When a player reaches 1300 after a tournament, this qualifies the player for the black level! Kyle joins Evan, Jason, Reid, and Fernando at the Black level. Reminder: the Purple and Black wristbands can only be earned by competing in USCF-rated tournaments and earning a certain rating. 900 is the rating for Purple, and 1300 is the required rating for Black. OTHER RATINGS NOTES: in the USM tournament, Will Schantz raised his rating over 100 points to 1,111! Will is also approaching the Black level. Evan Seghers raised his rating also, to 1754, passing Jason Markowski by ONE point... Evan and Jason have been neck and neck this past year for 1st board Varsity! 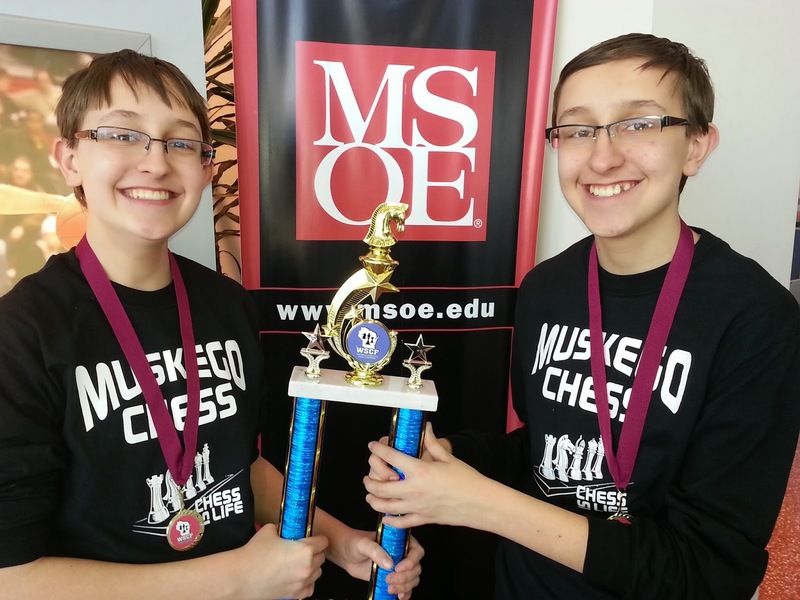 Muskego players flexed their "chess muscles" and did well at University School on Saturday. 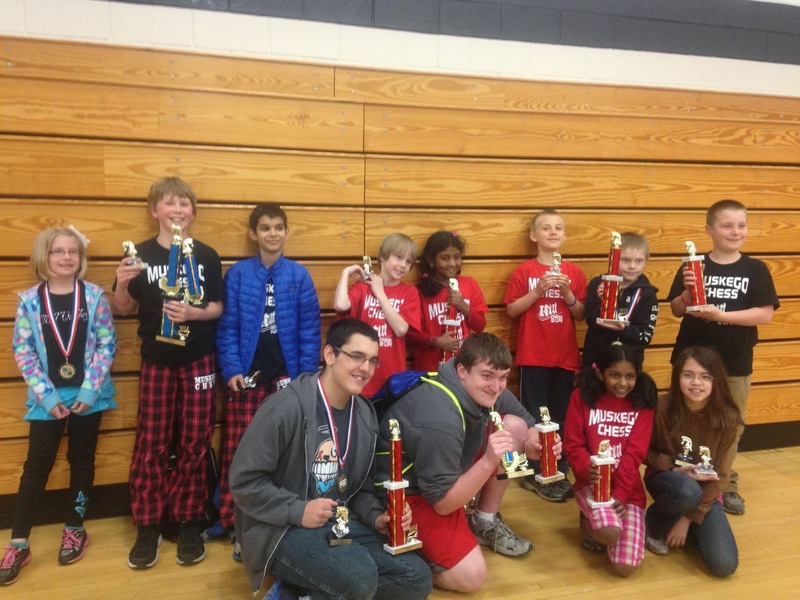 In the K-12 division, Muskego High School took first place, and Lake Denoon Middle School took 2nd place. Individually, Evan Seghers took first place, with 4.5 out of a possible 5.0. 2nd place was MHS' Jason Markowski with 4.0, 3rd place was MHS' Fernando Collahuazo (who played a great game against Evan to a draw in the final match), and 4th place went to LDMS' Kyle Jain. Will Schantz finished 10th with a trophy (3.0) and Kolton Otterbacher also had 3.0 and finished 13th. 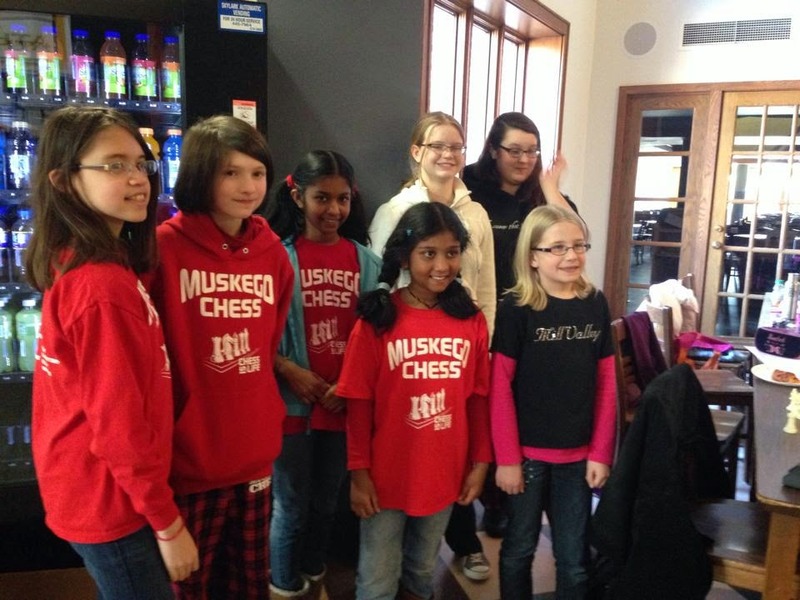 In the very tough K-6 division, Alyssa Przedwiecki took 18th out of 41 players by going 3.0, and her BLMS teammate Anoushka Prasad also won 3/5 to finish 20th. 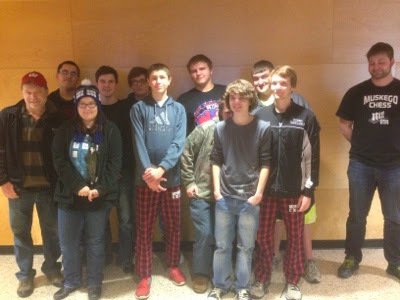 Several other MSCC players competed and nobody finished with 0 points. In the equally difficult K-3 division, congratulations to Nate May for winning 3 out of 5 games. This was a very tough tournament to start the season with, and we congratulate everyone who had the courage to jump into the mix in the tough USCF-rated tournament. We especially praise the kids who took notation and can therefore LEARN from their losses! 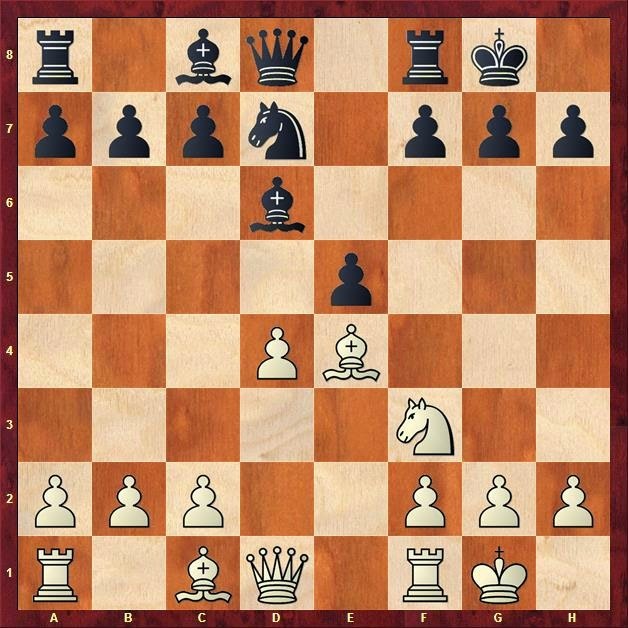 Chess notation is very important for players who wish to improve their game! NEXT UP: OUR OWN TOURNAMENT on December 13th at Lake Denoon! We'll have the signup form up today or tomorrow. 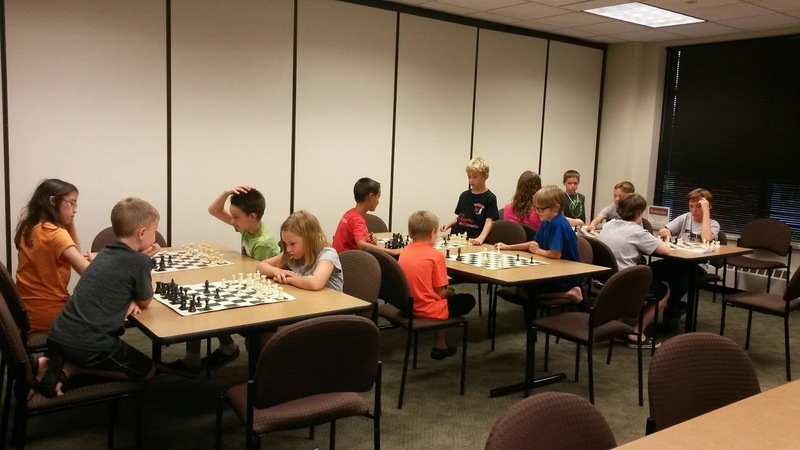 This tournament will also have UNRATED divisions for beginners (both K-4 and K-8 divisions), as well as the usual USCF-rated K-3, K-6, and K-12. The annual tournament at LDMS is getting close - Dec. 13th! Aside from being a great local tournament for both beginners and more advanced players, it's the Club's main fundraiser for the year, and to be successful we need your help! Karla Klein has set up something called "Sign up Genius" as a way for people to sign up for time slots to help out with everything from player check-in to the concessions stand. Please check this out and consider signing up for what you can - we really appeciate it! If you have any questions, please feel free to email me (dan.schantz@aptar.com) or Mark (segers@gmail.com) with any questions about the tournament details overall, or Leah (leahmike@ymail.com) about anything related to concessions. If you haven't done so already, please pick up your MSCC apparal on Wed, Nov 19. There's no class Wed, Nov 26. The UNIVERSITY SCHOOL tournament is on Nov 22nd! CLICK HERE TO REGISTER. Our own LAKE DENOON tournament is on Dec 13th! Mark the calendar! Registration will be open on 11/24. Top Four MHS boards do well at Junior Open! 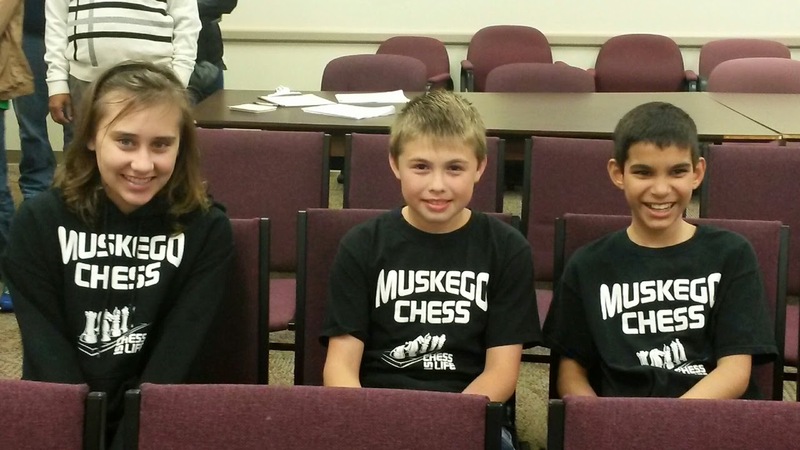 Congrats to our top 4 boards for our Muskego High School chess team for doing extremely well at the Junior Open in Oshkosh this weekend! Special congrats to Fernando Collahuazo, who established a brand new USCF rating of 1748 by going 3.5 - 1.5 in the 5-round tournament, beating an 1163, a 1406, a 1542, then ALMOST beating a 2021 (a slight miscalculation in the endgame only), then drawing a 1652. Evan Seghers went 4-1 to finish 5th in the 73-player Open division and take home a trophy. Jason Markowski finished 3.5-1.5 and Reid Seghers finished 3-2. 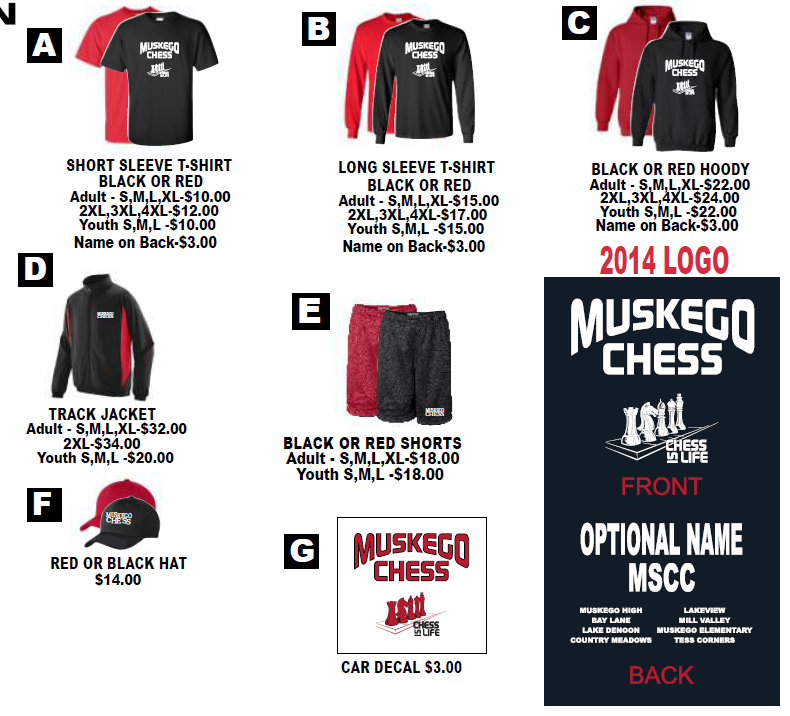 Muskego Chess made a statement on Sat/Sun, nice work boys! This past week's lecture was about the Greek Gift. A thematic sacrifice, it is called the Greek Gift as it is similar to the idea of the Trojan Horse from the Trojan War. The above position is from Sharma, K vs Nielson, C. at the USM Tournament in 2013. Homework: Analyze the Bxh7 sacrifice and show in notation if it is correct or incorrect. If it is correct, make sure to show all of Black's best responses. No bad moves for Black! If it is incorrect, what should White play instead? REGISTER NOW for University School Nov 22! CLICK HERE to register for USM! 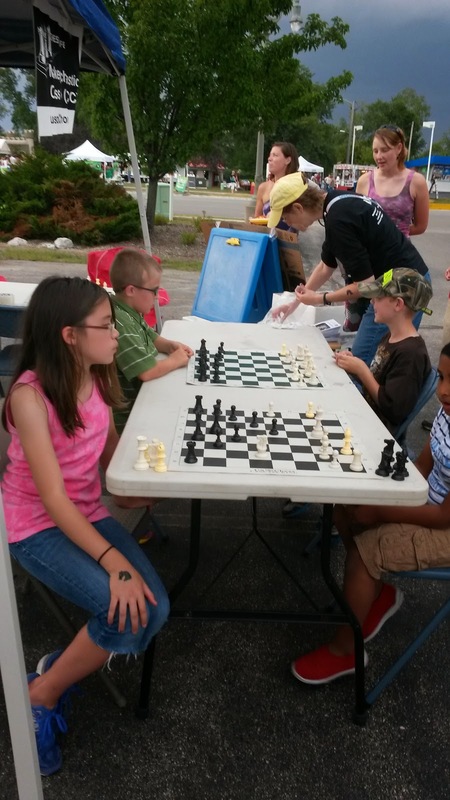 The Muskego Scholastic Chess Club will register players as a group - just CLICK HERE to fill out the quick form to let us know of your child's interest to play. We have emailed a flyer to all parents - let us know if you don't have one, and we will email it to you. A few players just decided to go to the Wisconsin Junior Open this weekend at UW-Oshkosh. It's a Saturday/Sunday, 5-round tournament... LONG games... let Mr. Seghers know if you're interested- seghers@gmail.com. This is for Red Division and up, primarily, and there is both an Open Division and a Reserve Division. MSCC at ASA Clark - Check out the hardware!! 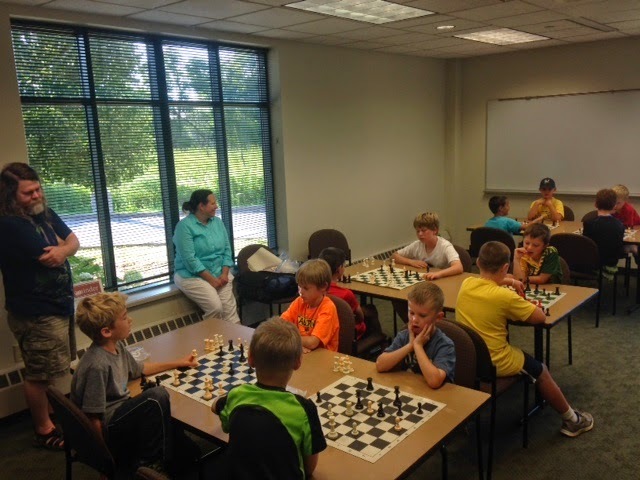 MSCC had a fun & successful day at ASA Clark in Pewaukee for the final scholastic tournament of the school year and final Grand Prix event as well. Alex Swiezynski for taking 1st plact trophy with 4 wins! Michael Swiezynski for taking 6th place in his FIRST tournament w/ 2-1/2 points! Rachel Fredlund hung in there and got her first win ! Anoushka Prasad had no losses (3 wins, 2 draws) and took the 3rd place trophy! Alyssa Przedwiecki took 6th place with 3 wins! Kenny Mies took 13th with two strong wins. Special shout out to Kenny who chose to play in the stronger USCF division so that he could be on Kyle's and Will's team. His wins pushed the 3 person team into 2nd place! Jason Markowski took 2nd place with no losses, only missing first place on tie breakers with 4-1/2 points! And now, the GRAND PRIX year-long awards. Will Schantz took the 3rd place trophy in a very close finish! He gave up his 1st place traveling cup from last year and was given his replacement engraved trophy to keep. Kyle Jain took 10th place with a strong year, especially considering his late start in the year! K6 team - Lake Denoon took the 2nd place team trophy! Even Seghers hung on to 2nd place after a very strong year, and he could not be at the tournament because of spring break. He was given a replacement trophy to keep as he turned in his first place traveling cup from last year. K12 Team - MHS finished the strong year with a 1st place team trophy! Congratulations again to the MSCC for very strong year of playing and demonstration of good sportsmanship! As you can see we need some more students to make some teams!! Last club event of the season - please let me know if you can make it and I'll sign you up. I can take one or two with me if that would help, or, if you can drive but can't be there for the day I would be happy to keep an eye on the players during the day. I'll be there the whole time w/ Will. If you can make it, please email me directly at dan.schantz@aptar.com and I'll sign you up. Please sign up for ASA Clark on April 26th by using the form below. Remember to choose the division- there are K-3 and K-6 unrated, and K-3, K-6 and K-12 rated (USCF). Hi MSCC parents! I just wanted to say thank you very much for the gift card, candy and card given at the last class - it's very much appreciated. My travel the last few weeks has unfortunately kept me away from the last classes and tournaments, but we'll be at the upcoming ASA Clark Tournament and hope to see a big group there! It has been a real pleasure being a part of the MSCC growth this year, and seeing such a great group of students progressing and really becoming a dominating club at the tournaments. I'm already looking forward to the next year!! Muskego Takes State All Girls! Muskego sent 7 girls to the annual Wisconsin All Girls tournament. In the OPEN section, we had two participants - Rachel G and Alyssa. The top THREE scores count, and we only had 2 players, but we still tied for 1st place with a team with 5 players! Rachel went 4-1 and took 2nd in the state! Alyssa also did well, winning 2 against some very strong players in this top division. We had one full team- in K6 U450- and the team of Julia, Willow and Anoushka finished in 2nd place out of 7 full teams. Anoushka finished 2nd place individually out of 30 kids, going 4-1 and earning her RED wristband! Anoushka has been a very strong player in this, her first year of chess! Willow finished in 6th place, and Julia finished 9th. In the K-4 division, we had 2 players - Rachel F and Alabhya. 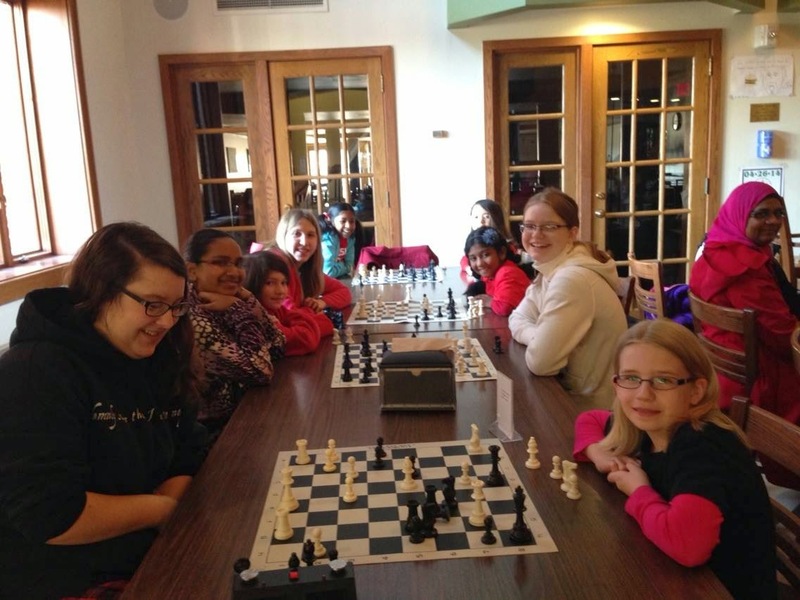 This was Rachel's FIRST chess tournament, and Alabhya's second! The girls did very well, earning several draws. Way to go MUSKEGO GIRLS! Good Luck to Muskego Girls tomorrow at the ALL GIRLS! Here are the girls from the MSCC who are attending the All Girls tournament at US-M tomorrow (Sat Apr 5). We have a full team in K-12 U600, and partial teams in the other two divisions. Of course the girls are all participating as individuals as well. This is a great annual tournament! Congrats to Kyle Jain who endured a late school night to earn 2 draws against very strong players and raise his rating to over 1100! Hope you'll join us on Saturday April 12th - fun for all ages - tournament is USCF rated and recommended to Red Division and Up primarily. High Schoolers next year! Jack, Elliot and Daphne take 3rd in 8th grade, way to go! 3-Round Swiss in Two Sections (G/30 Minutes and G/24 Minutes). USCF Rated. EF: $5.00. (½ Point Bye available for only first round if requested prior to round) TD is Becker; ATD is Grochowski. Evan and Jason should be at this event. Join us! One night, three short games. If you choose G/30, your game will count against your regular rating. G/24, it will count against your Quick rating. Scholastic players often do well at these types of games because they are used to playing lots of short games. To join, just show up at the Hales Corners police station at around 6:30 or so on Thursday evening. 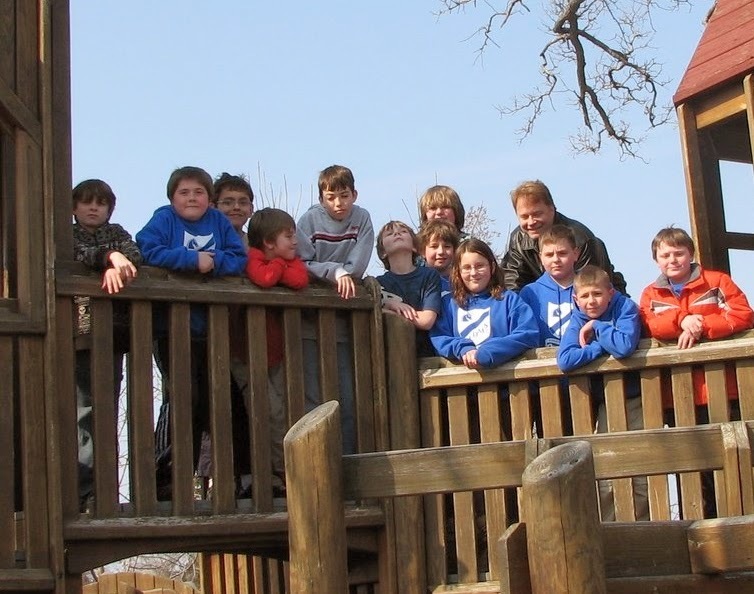 6th Graders Take State Grade Level! Several of our Red level players were missing for Grade Level - including Will and Aaron in our very strong group of LDMS 6th graders - but with the smaller team of Kyle Jain (4 wins), Nick Schuster (3 wins) and Chloe Adamson (2 wins), we took 1st place in the state for 6th Grade! Way to go LDMS! This is a state championship for that grade. The team of Jack Bognar (3 wins), Elliot Bognar (2 wins) and Daphne Adamson (2 wins) also did well, taking 3rd place for 8th grade. Overall, and outside of the results above, several of our normal top performers did not see as strong of results at this Grade Level tournament. If we are to praise our own accomplishments, we must also recognize when we didn't do as well as we could have, and we must learn from these times. It's the losses that make us appreciate the wins that much more. It's a very difficult tournament as scholastic tournaments go, and it's the end of a VERY successful first year for the Muskego program. We should feel very happy for what we have built, and very proud of all the kids who jumped into chess brand new this year, and competed so hard and so successfully in tournaments throughout a very fun year. Chess is FUN - and that is the main thing to remember. If we can have fun regardless of whether we win or lose, then we ALWAYS win. I'm very proud of our kids- every one of them- and am very thankful to be a part of their experience.